All of my Christmas gift knitting is finished, or at least I think it is complete. I made earflap hats for my great-niece and great-nephew. They both live in Minnesota and like being outdoors, so these double wool earflap hats should see a lot of wear. My great-niece loves to play hockey, so the Thorpe hat was the perfect pattern for her. I didn't have any real issues with the pattern. Instead of adding braids to the hat, I added i-cords because they will be more sturdy. 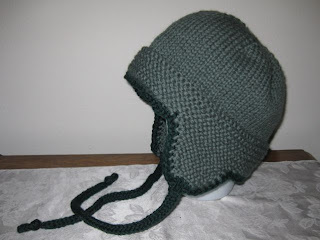 Not being a crocheter, I struggled with the edging, but with the help of the internet and a how-to video, I managed. The only "problem" with the pattern is the garter edge has a distinct line where the rows meet. 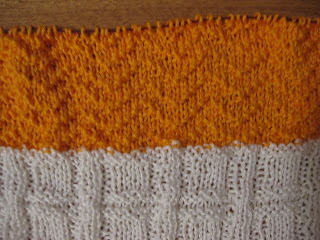 After I finished I read about a jogless garter stitch on Kathryn Ivy. If you are interested in making a Thorpe, I advise that you use the jogless technique. It was a struggle to find a good pattern from my great-nephew, who is two years old. 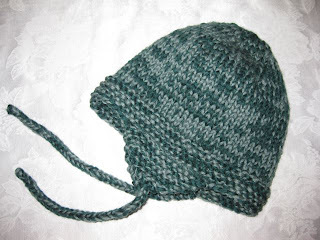 Most of the earflap patterns I found were for adults, teens, or babies. I tried several patterns, only to frog because they were too large or too small. Finally, I discovered a pattern by Kristina at Yarnsticks that was designed for 2 - 3 year olds. 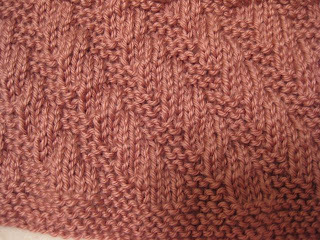 The pattern is written for chunky yarn, so I used two strands of worsted weight, and I am pleased with the result. I still have two gifts to prepare, but they will not be knitted. 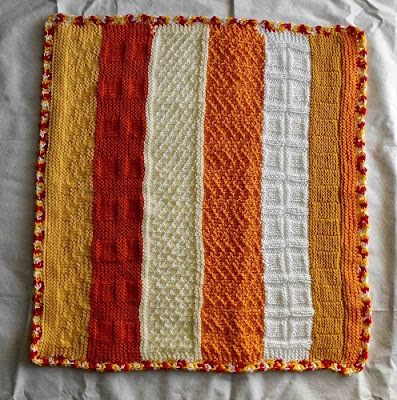 Orange Sherbet, a West Coast Oddball blanket, arrived in the mail on Saturday, October 26th and was ready to mail on to the next knitter on Sunday. 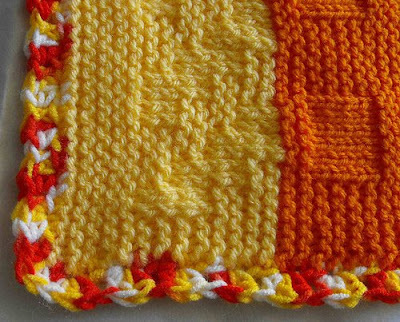 I used a Simply Soft (Mango) in a Single Chevron Stitch for my section. It's only one pair of socks, but at least I finished them in time for the afghans for Afghans Youth Campaign's October 29th deadline. 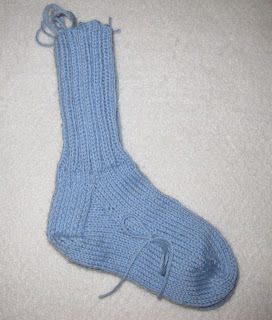 A new goal is to stockpile socks in various sizes for these special campaigns that appear from time to time. Five additional quilts round out my list of completed projects, but since I posted about them recently, I will not give the details again. You can find the posts for each of the quilts below. 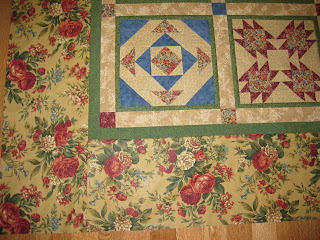 Down the Garden Path is at the longarm quilter, so technically it does not count as a completed project. 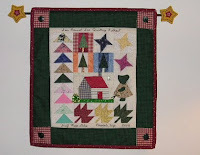 I haven't worked on the half-square triangles in a long time: I've been concentrating on Christmas projects. 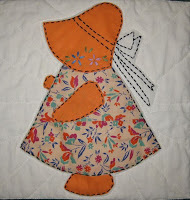 My great-niece's Christmas gift was finished earlier this week - a quilt made especially for her baby doll. The top and binding were made out of scraps of other projects, and the backing is a piece of a white, flannel sheet. The finished size is 24 X 24 inches. I think she will enjoy playing with this little blanket. Asian Pinwheels was a Christmas gift from my sisters in 2004. They noticed that I was admiring the Asian prints at the Stitchin' Post in Sisters, OR and decided to surprise me. It was truly a surprise when I opened the box on Christmas morning. Velveteen Rabbit, a Midwest Oddball Blanket, is ready for the next knitter. I used Simply Soft (Plum Wine) and knit Garter Steps for my section of this blanket. Mom's Rail Fence was made with scraps from Breezy Point. 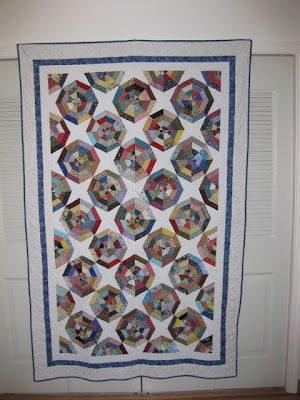 It is definitely a scrappy quilt. The vintage flour sack fabric is unique and somewhat gaudy, but true to the time period. It measures 58 X 74 inches. All of the blocks are vintage flour sacks, but the border and backing are 30s reproductions. It was machine-quilted in 2007 by Designs by Deb in Littleton, CO. She used a flower design on the blocks and a larger flower design in the border. 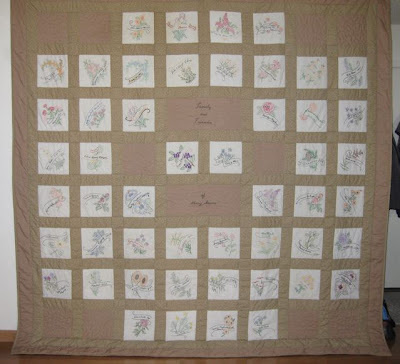 Breezy Point is a signature quilt made to commemorate a week-long, family reunion, held in Minnesota in 2006. Marilyn and I ironed blocks of muslin on freezer paper to stabilize the fabric for signatures. Each person signed enough blocks to allow each family unit to make a quilt, if they desired. Each person's block is arranged by age on my quilt. Others arranged theirs by family. The pattern is Goose Creek. I used muslin and vintage flour sacks that my mother had collected for the blocks. The border utilizes 30s reproduction fabrics. The backing is also scrappy with 30s reproduction fabrics. It measures 60 X 72 inches. Quilt, Quilt, Quilt, Etc. in Sandy, UT machine-quilted the top. 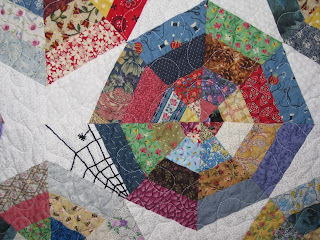 Spider Web was paper-pieced, using scraps of Round About. I was pleased to make two quilts out of the fabrics from the Sisters, OR trip challenge. I embroidered the spider web on one of the blocks before it was quilted. This quilt is 54 X 80 inches and is the perfect size for the sofa. Spider Web was machine-quilted by Quilt, Quilt, Quilt, Etc. in Sandy, UT in 2005. The borders each have a different quilting stitch. The backing on this quilt is a blue print. 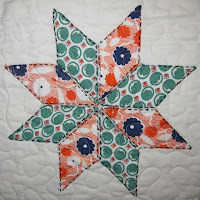 Spider Web was donated to the Quilter's Newsletter drive for victims of the Japanese earthquake and tsunami. I pray that the recipient finds comfort in this quilt. This sign is in the Kmart lot right next to the Handicapped parking spaces. One of the clerks, who ironically is pregnant, answered my inquiry. Yes, the sign is legitimate, and this clerk who works at the service desk keeps a sharp eye out for any violators. 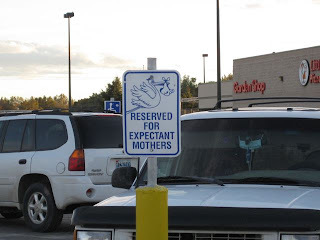 I realize that mobility may be difficult for expectant mothers, but special parking is simply not warranted. It is an absurd notion that being pregnant is a debilitating condition. Let's send the woman's movement back in time, shall we. This sign, in my opinion, is a mockery of handicapped parking and is in poor taste. 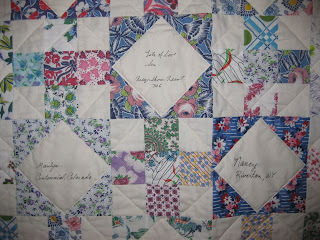 One of the first quilt-related trips that my sisters and I made was in 2004. 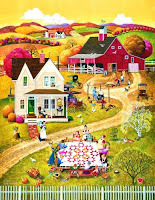 Quilters know that every year Sisters, OR hosts a one-day outdoor quilt show. Hundreds of quilts are hung everywhere - on the sides of buildings, on stands in grassy lots, in restaurants, in stores, literally, everywhere. We enjoyed the trip so much that we are going again in 2010. 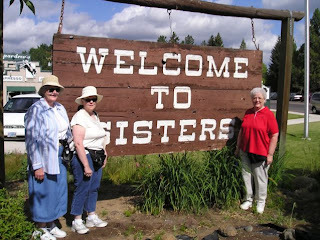 We drove to Oregon and stopped at numerous quilt shops both ways. We made a pact to purchase at least one fat quarter in each shop. At the end of the trip, we divided all of the fat quarters into thirds. Each of us had to make a quilt, using all of the fabrics. 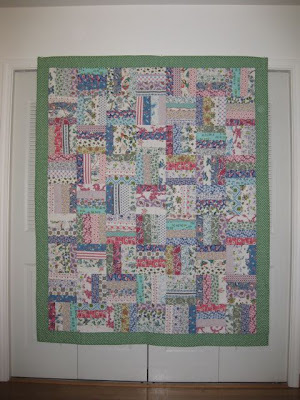 I was a novice quilter and picked an easy pattern, the Friendship Scrap Block, and was the first to finish a quilt. I used black fabric to symbolize the highways that we traveled. Round About measures 68 X 80 inches and was quilted by Quilt, Quilt, Quilt, Etc. in Sandy, UT. 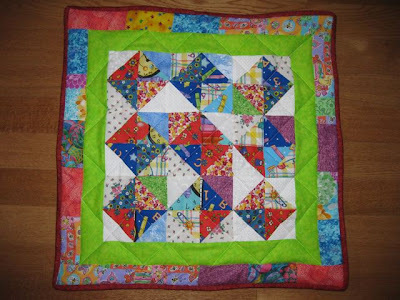 It is quilted with an leaf pattern. The backing is a solid red. Fabrics from the 1930s and 40s are very distinctive. 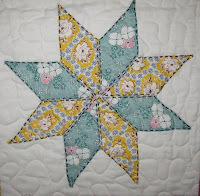 Many of my mother's hand-pieced and appliqued stars use fabrics from flour sacks. 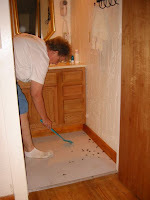 She did a lot of baking and collected piles of fabric from the 50# bags of flour. Mom used the flour sacks for aprons, pillow cases, dresses, etc. I can't imagine wearing some of these wild prints, but fashion was different then. 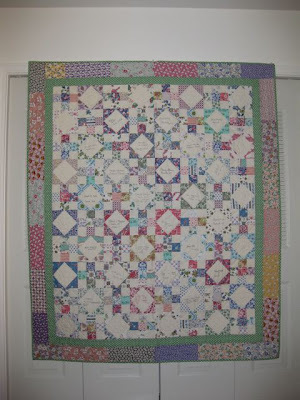 Since the blocks were very scrappy, I used my own scraps to frame the blocks and for the second quilt border. The backing is plain muslin. 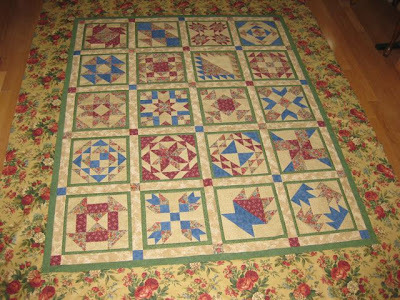 It is machine-quilted by Diane Fike: she used an all-over meander. 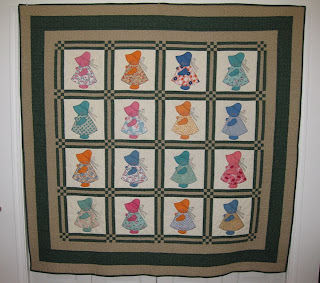 This quilt was finished in 2003. My mother hand-pieced and appliqued 47 of these little girls on unbleached muslin at an unknown time. She stored the blocks in the cedar chest, and I remember admiring and playing with them. The dresses are made from flour sacks. Some people call them feed sacks, but mom purchased her baking flour in 50# bags made from this cloth. She baked her own bread for many years. She even pieced some of the dresses to stretch her fabric, note the dress on Sue with orange hat. Mom died unexpectedly in 1989, and the blocks were divided between my sisters and me. 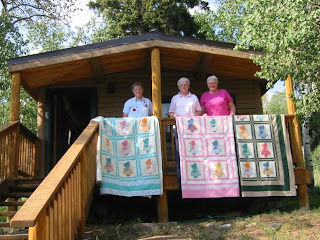 The Summer of 2002, I suggested to my sisters that we rent a cabin in the mountains for a week and make quilt tops with the blocks. Marilyn and I scouted to find the perfect place to meet, and the planning began. We selected Half Moon Lake Resort near Pinedale, WY for our retreat. We packed our sewing machines, tables, ironing boards, etc. and headed to the mountains. The cabin was a bit more rustic than we would have liked, but it worked. One of the more memorable events occurred each night. The window screens were not very tight, and hordes of moths (we call them millers) were drawn to the lights in our cabin. The millers aren't dangerous, but they are a nuisance. The dust on their wings is hard to remove from fabric, and of course, we were surrounded by fabric. Evelyn went on a rampage until the floor was covered with their bodies. The carnage continued each night. We sewed and laughed; we told stories and gossiped. Sometimes we sat on the small deck and waved at the other guests, riding horses to the trailhead. The maid came by daily to clean and to check on our progress and took the picture us with the finished tops. By the end of the week, each of us had completed a quilt top and a small paper-pieced wall hanging, pictured at left. Diane Fike did the machine-quilting. She used a meander in the border and radiating lines in the blocks. 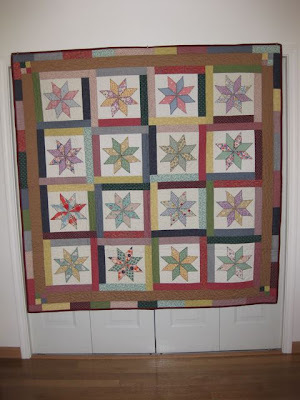 This is the first of two quilts that I made using blocks made by my mother. Yesterday, I spent the entire day taking photos of my quilts. It is a project I should have done a long time ago. After I took the photos, I gathered all the receipts and information and prepared pages for a Quilt Journal, which used to be available on the Hewlett-Packard site. Other free projects are listed in the left side bar. Check them out and have fun. 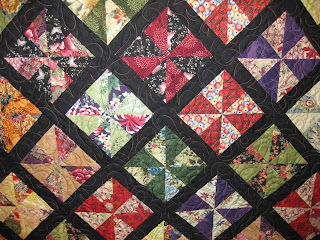 I'll be posting information and photos of my quilts throughout the next week. My first quilt took me nearly 30 years to complete because it kept growing with every move that I made. It ended up being 101 inches square. I don't use this quilt often because it is so large. It is large enough to be a bedspread for my double bed. It all began in the 1960s. I ironed the transfers of state flowers on bleached muslin and then sent the blocks to relatives, neighbors, etc. for signatures. 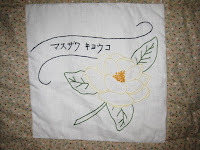 They could embroider the flower and their signature themselves or send them back for me to embroider. I have signatures from all but one of my aunts, and of course, my mother, sisters, and nieces. A few close neighbors and family friends' signatures were also gathered in the 60s. I also have signatures from my colleagues from three schools. In the 70s, I was in Wheatland, WY, in the early 80s, I was in Japan, and by the mid-80s I was back in Wyoming. I embroidered all of the blocks from my teaching years because no one knew how to embroider. 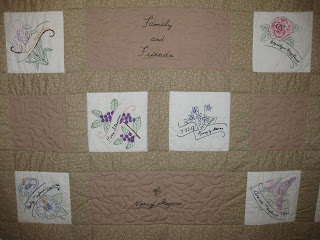 My sisters assembled the quilt in 1994 while I was in the hospital recovering from a surgery. I had to rip out the row that contained the block shown above because they had sewn it upside down. I don't know why I didn't have it quilted until 1998. Of course, in those days, it was not easy to find a longarm quilter. 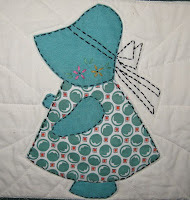 I wish she had done more quilting on it. 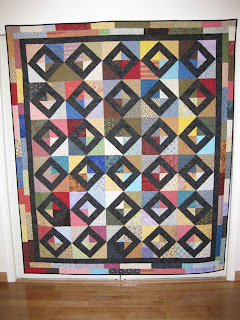 Most of the quilting is "stitch in the ditch" with some meandering in the plain blocks. 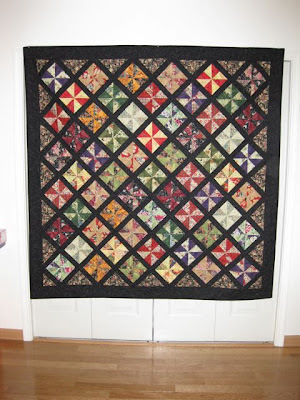 It was quilted by Hazel Hatcher in 1998. Sadly, so many of the people have passed away, but I am glad that I have preserved a small remnant of their lives on my Friendship Quilt. This ugly duckling has turned into a swan! Since the fabrics have so many flowers, I've named the quilt, Down the Garden Path. The links to the individual block patterns can be found here. Neither Snow, Nor Sleet. . .